Our group of twelve Yogis, led by Wenche and Eva, touched down in Egypt on 22 March; all excited and all not really knowing quite what to expect. To say the week’s experiences surpassed every single person’s hopes and dreams would be a massive understatement. The eco camp is magical and as you set foot on the sand and gaze at the beauty of the Red Sea and the peacefulness of your surroundings, an overwhelming sense of calm fills you. The tents are amazingly comfortable and definitely fit the Western definition of ‘glamping’ with friendly staff sweeping them daily, making the beds and providing fresh towels. As for their location on the shoreline of the Red Sea, how blissful to fall asleep and wake to the sounds of the waves lapping the shore. Every single diet and taste was catered for in the beautiful terraced camp restaurant including a dedicated egg chef at breakfast and a pastry chef who made the most irresistible desserts. As for the coffee/beach bar where you would most likely bump into Stella, the camp dog; coffee, tea cake and soft drinks were available all day together with cake if you fancied it. You could pull up a chair in the shade or a bean bag in the sun and simply relax as the sun glistened on the sea in front of you. For the intrepid within our group Eva and Wenche had arranged plenty of optional trips including riding camels into the desert to meditate at sunset, swimming with ancient giant turtles in a beautiful bay and taking a speed boat out to Dolphin House reef to swim with the dolphins when they returned there in the early morning. Khalid, our super knowledgeable and hilarious guide for the week took care of everything and everyone. 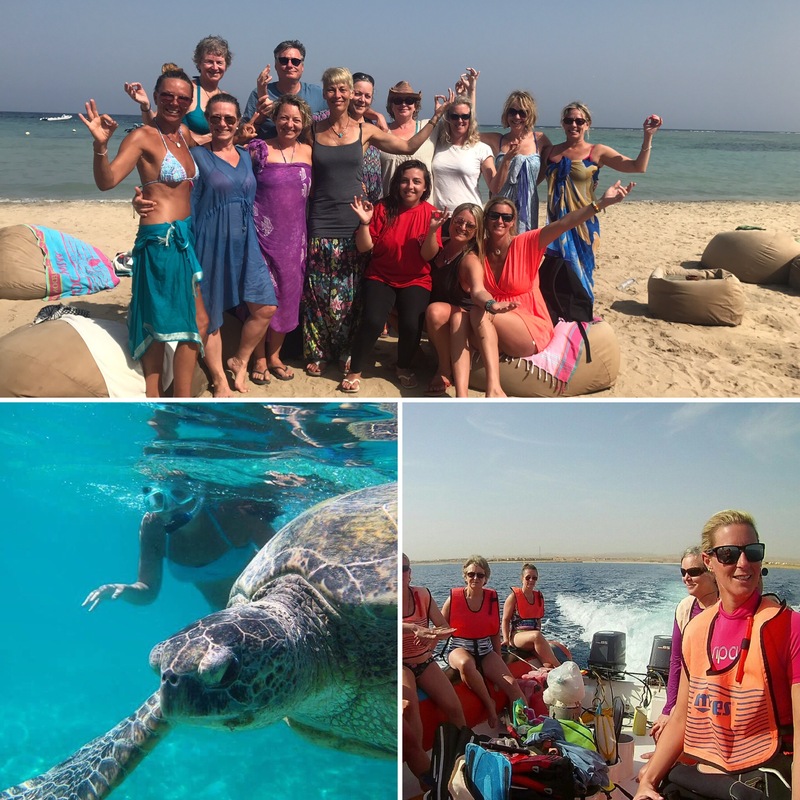 Some of the group did trial scuba dives with Red Sea Diving Safari and most days we would walk out into the sea to the breathtaking local reef and snorkel. Never have I seen so many vivid colours in the coral and the fish – it was like watching Blue Planet but seeing it with our own eyes. To add to the relaxation many of us had a massage in the massage tent on the camp. Everyone agreed they had never experienced a massage like it, emerging to say they felt to be floating with every scrap of tension released from their body. In fact many went back a second time to the masseur/healer we called ‘Magic Hands’. The Bedouin Bar, run on the camp by a beautiful Bedouin family, was great fun at the end of day where we could sit with our feet in the sand and gaze at the stars overhead with a glass of wine and an apple shisha. In fact one evening a surprise party was arranged for us complete with Bedouin musicians, dancing, a beach fire and the most enormous telescope to give us a close up window on the stars. And all this before I get to the yoga! To practice yoga and meditation overlooking the sea in Egypt is truly exceptional. Something about the ancient land beneath your feet creates a deep connection with nature, the earth and the elements, which we so often lose in our busy day-to-day lives. And to be led by teachers like Wenche and Eva is unbelievable. Every morning and every evening we met as a group on our mats for an hour and a half practice which always unfolded some new understanding of ourselves. I have never practiced yoga in the way we practiced, the total freedom to listen to your own body and move how you needed to move was liberating. The explanation of the thinking behind the principles of yoga was enlightening and the encouragement to explore yourself was inspiring. It was the most uplifting and transforming experience and one for which I will always be grateful. Our final practice which included partner yoga and group yoga positions was just great fun and cemented the ties between us all. And finally, this eclectic group of fourteen individuals, many of whom met for the first time in Egypt have formed friendships that will last a lifetime. So much joy was shared, so many barriers were broken down, such honesty and care was given. The trappings and restrictions of everyday life were stripped away and people could ‘just breathe and be’. That is the rare gift that Egypt gave us all and why so many of us are hoping to return very soon.